In the week ended 28th April 2016, AcuComm added 44 new or updated projects to our Business db, worth an estimated US$5,726 million and waste capacity of just under 9.4 million tonnes. This takes the total estimated investment value of projects to US$297 billion. 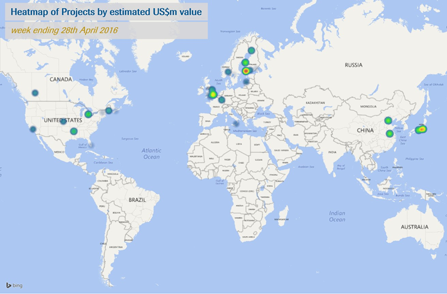 The leading countries in the past week were the USA with nine projects, and the UK with six. The average active waste project is worth US$74 million. As part of AcuComm’s Sales Package, your sales team can identify and engage with the projects that are right for your organisation. From gaining access to ‘real-time’, unrivalled coverage of all major waste, renewables and energy projects worldwide to identifying monthly and annual sector trends, you can be sure to understand the latest developments and trends that are driving the sector. To put our database to the test, arrange a demo today. In recent weeks, various contracts have been awarded by Borås Energi och Miljö relating to the Energi-och Miljöcenter complex, comprising of a biomass combined heat and power plant, anaerobic digestion/biogas facility and wastewater treatment plant (WWTP) in Sobacken near Borås. TGM Kanis Turbine will supply a steam turbine and generator with an electrical output of 44 MW, plus a turbine condenser that can deliver 75 MW of heat to the local district heating network. Veolia Water Technologies has won the contract to design and build the new WWTP, while Veidekke was awarded a SEK400 million contract to construct the transmission lines, an outlet pipe from the sewage treatment plant, a sewage pumping station and a mini power plant. For the latest updates on this development, click here. 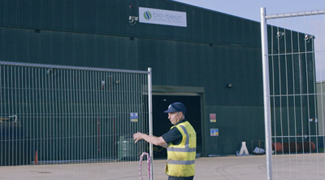 On 18th April 2016, Leeds City Council announced that development of its new £460 million recycling and energy recovery facility had been completed and handed over three months earlier than was previously reported. It will process up to 214,000 tonnes of black bin waste each year and will supply the National Grid with 11 MW of electricity. To find out more on this updated project, click here. This small but innovative project will be North America’s first zoo-based biogas plant! Set to be operational by early 2017, it plans to convert 3,000 tonnes of zoo animal manure and 14,000 tonnes of unwanted grocery store produce into power and fertiliser. The 500 kW facility will also prevent 10,000 tonnes of CO2 a year from being released into the atmosphere. More information on this construction can be found by clicking here. Earlier this month, it was revealed that two biomass projects will be taking place as part of a programme to help Luxembourg achieve its national target of producing 11% of its energy from renewables by 2020. Both the first and second projects are available in our Business db. In the week ended 21st April 2016, AcuComm added 40 new or updated projects to our Business db, worth an estimated US$5,283 million and waste capacity of just over 9.3 million tonnes. This takes the total estimated investment value of projects to US$296 billion. Municipal Solid Waste and sewage/wastewater were the leading feedstocks in the past week, accounting for 4.4 million tonnes and 1.2 million tonnes, respectively. The leading countries in the past week were the USA with six projects, and the UK/Canada with four apiece. AcuComm’s Search Analytics was launched at the beginning of the year and is now being used by 100s of organisations across the world. Not only does it show you the potential of today and the next three years, but it also gives you actionable strategic data and access to the details of 1000s of business and project decision makers we have in our database. Search Analytics is unique and entirely free to use, so if you’d like to try it for yourself, click here. Making smart use of coffee grounds hit the headlines this week with Centrica-backed Ignite making a £10 million investment which will enable bio-bean to expand its Cambridgeshire factory. The facility was one of the first in the world to produce biofuels from the recycling of waste coffee grounds. You can find out more on this project by clicking here. Meanwhile, in the Netherlands, SUEZ and Koffie Recycling Nederland (KRN) are to build a plant which will also produce biofuel from coffee grounds. SUEZ and KRN are launching a nationwide collection system to obtain waste coffee grounds from restaurants and offices. Several large companies have pledged to start recycling their coffee, including the Belastingdienst (tax administration), Delta Lloyd and Inntel Hotels. To discover more on the progression of the construction, click here. 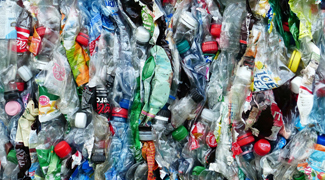 Last month, Indaver announced that it is planning to build ten new plastics recycling facilities across Europe. Each will have the capacity to treat 100,000 tonnes of mixed or lightly contaminated plastic, with the first facility located in Belgium. Click here for the latest developments on this project. Earlier this month, NGF Nature Energy announced the inauguration of its new biogas plant in Denmark. The plant is just one of the three major biogas plants that NGF Nature Energy has started operating over the 2015/16 period (see projects 2251 & 2274 for more information). For more details on this development, click here. In the week ended 14th April 2016, AcuComm added 34 new or updated projects to our Business db, worth an estimated US$2,489 million and waste capacity of just over 5 million tonnes. This takes the total estimated value of projects in the database to US$323 billion. Wood and Municipal Solid Waste were the leading feedstocks in the past week, accounting for 1.5 million and 1.8 million tonnes, respectively. The leading countries in the past week were the UK with nine projects, Canada with five and the USA with three. Why are leading suppliers to the Renewables & Energy from Waste industry incorporating AcuComm’s Sales Package into their sales process? Every day, our Senior Researcher’s at AcuComm collect information pertaining to the thousands of projects we have in our comprehensive Business Database. We are constantly striving to provide you with the very latest updates on each of these projects, which is why we are delighted to introduce to you our ‘Editor’s Pick of the Week’! The headline projects are all handpicked by our team of researchers, with a view to giving you the latest project news and updates before anyone else. 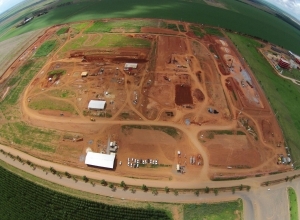 This will be the first modern corn ethanol plant in Brazil, with ICM Inc. announcing on 21st March that they have signed contracts for the design. While the story about the contract being awarded was widely reported, AcuComm have since been in contact with ICM and were informed that a ground-breaking ceremony was held on 29th March 2016. For more information on the latest update to this project, click here. On 14th March 2016, China Everbright International announced that it has been awarded contracts for the construction of two large biomass plants. Each will cost approximately RMB 350 million (>US$55 million). Both the first and second developments are available in our Business Database. 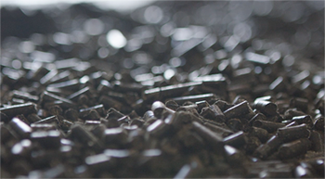 This huge project is one of the more recent additions to our database, outlining the development of a plant that will use wood chips, among other materials, as feedstock to produce approximately 75,000 kW of electricity per annum. Click here for more information on the planning phase. In the week ended 7th April 2016, AcuComm added 41 new or updated waste projects to our Business db, worth an estimated US$2,945 million and waste capacity of just over 7.5 million tonnes. This takes the total estimated value of projects to US$324 billion. Plant biomass and Municipal Solid Waste were the leading feedstocks in the past week, accounting for 2.8 million tonnes and 1.7 million tonnes, respectively. The leading countries in the past week were the USA with 12 projects and the UK with seven. If your organisation is looking to keep up to date with the latest global Renewables & Energy from Waste projects, then why not sign up to one of AcuComm’s Packages? Our unique understanding of the sector gives organisations the insights required to develop new and existing markets, alongside practical sales information to achieve tangible sales results. Put our comprehensive database to the test by booking a demo today! 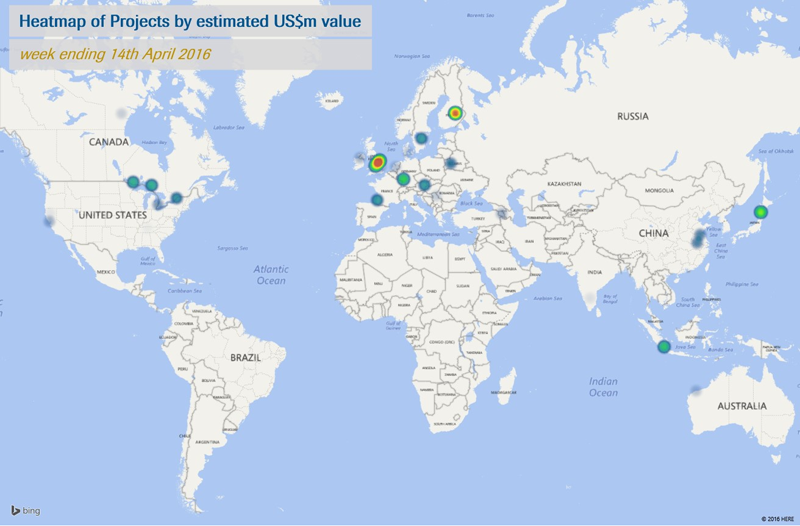 In the week ended 31st March 2016, AcuComm added 29 new or updated waste projects to our Business db database, worth an estimated US$2,132 million and waste capacity of just over 9.2 million tonnes. This takes the total estimated value of projects since 2013 to US$329 billion. The average waste project is worth US$83 million. There are naturally wide variations in average project value, due to the size, duration and complexity of different types of project. The leading countries in the past week were the UK and USA with six each, followed by China with five. If you are looking to keep up-to-date on the latest projects being added to our database each day, take a look at our Sales Package. With access to AcuComm’s Search Analytics, your sales team can cherry-pick the projects that matter to your organisation and instantly generate sales pipeline potential.